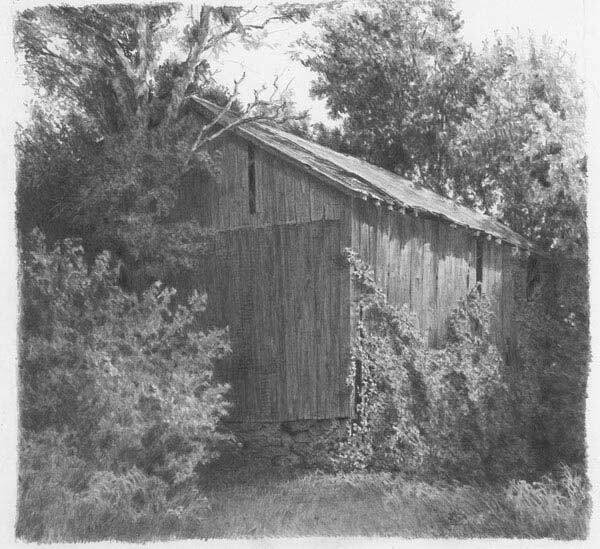 This photo was one of the only barn shots I got traveling to Indiana....but what a shot it is! The lighting was great and the overgrowth of ivy incredible. This was is a true 'drive by shooting', taken while we were driving on Interstate 80 at 70 mph! 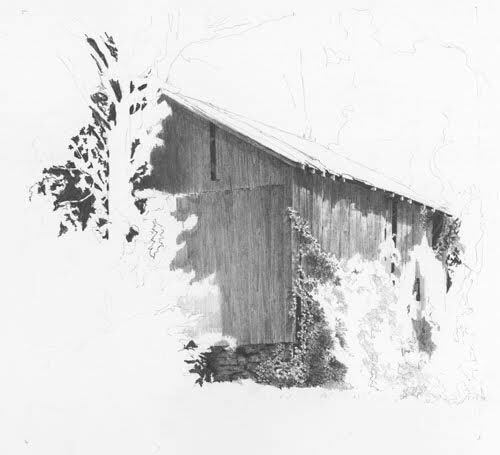 Wip 1: Starting with a light outline of the barn and placement of the trees and bushes. 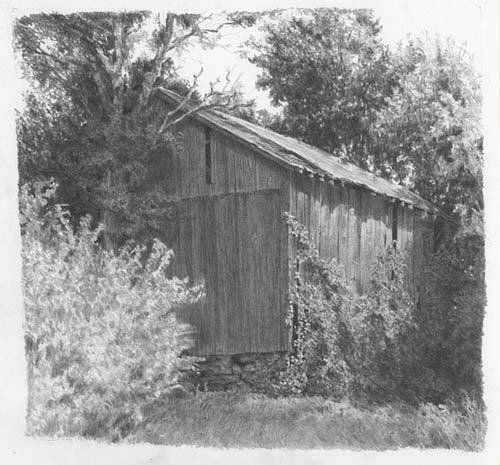 I started in the center of the drawing where the most detail and contrast of values reside. My goal of this drawing is to work on tonal continuity/composition and really pushing the darks. I'm forcing myself to use some pretty dark/stark negative drawing to get me jump started. 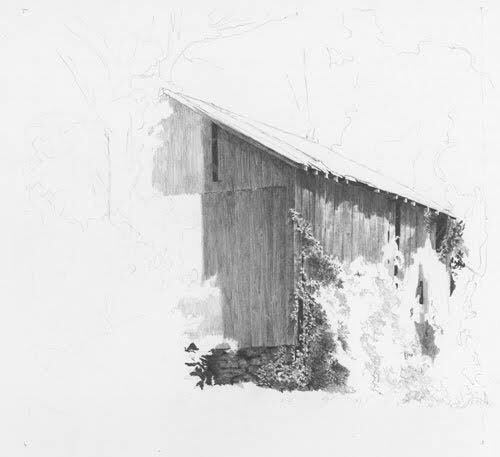 Wip 2: Working my way up the barn and into the shadows under the roof line. 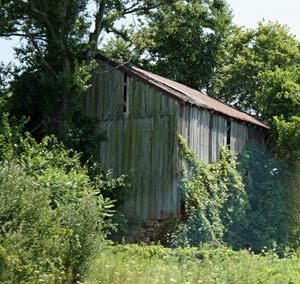 The holes in the edging of the roof line creates beautiful jagged shadows across the side of the barn. Wip 4: Starting to take shape. I really like the splash of highlights on the left upper tree. And I'm starting to shape the trees in the background. 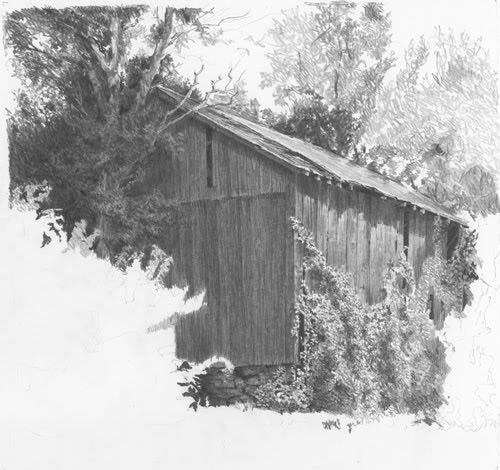 I'm slowly texturing in the ivy and the barn face is deepening in shadow as well. Wip 5: The background trees are adding depth to the scene...little spaces of sky peak through to keep the trees 'airy'. 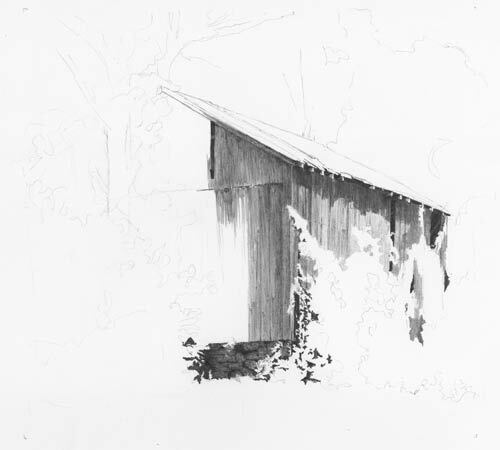 Wip 6: Really working on the deepest shadows to the right of the barn. 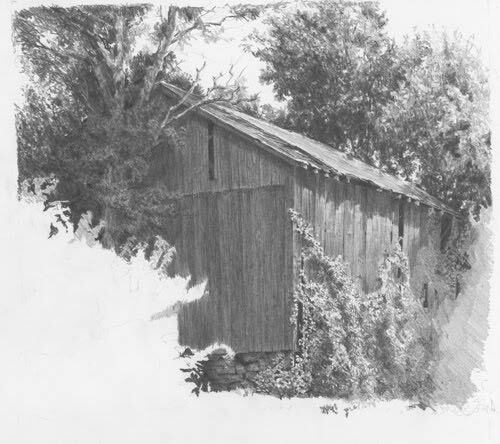 Darkening that corner has really pushed the barn right out the page! 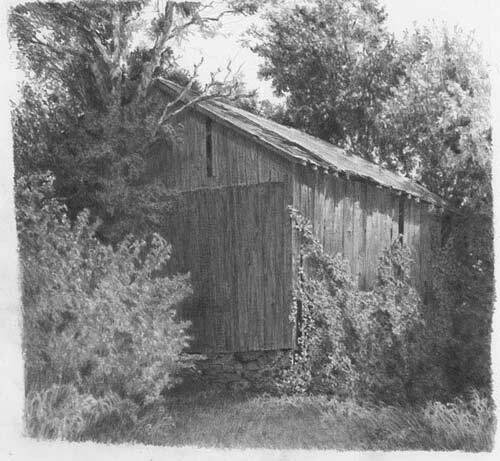 Wip 7: Shaded the face of the barn even darker, especially behind the bush and putting some detail back into the barn boards.Starting to define some of the grass in the foreground. The bush to the left if starting to be defined as well.